Starting with Next - not a sale I'd made plans to go along to but we got home late on Friday from Tipperary so I was up early on Saturday to get groceries and what do you know? The sale had started! I call that karma. Aware that the kids were waiting hungrily at home (although, in my defence, it was only 8.30am), I didn't linger and just did a quick sweep though. 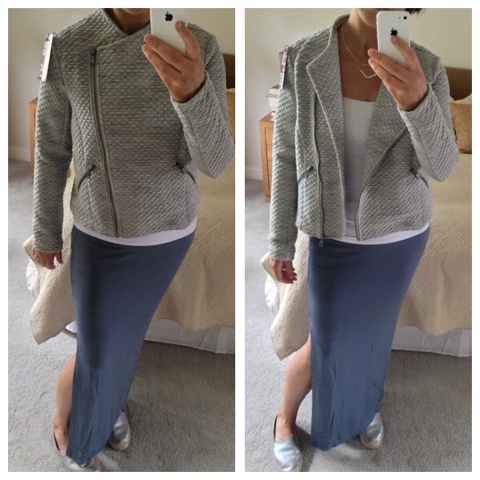 First up - a waffle jersey biker style jacket in light grey. I liked the feel of this and the fact that it's stretchy. But I wasn't immediately smitten though I think it could be a useful jacket that I would wear lots. 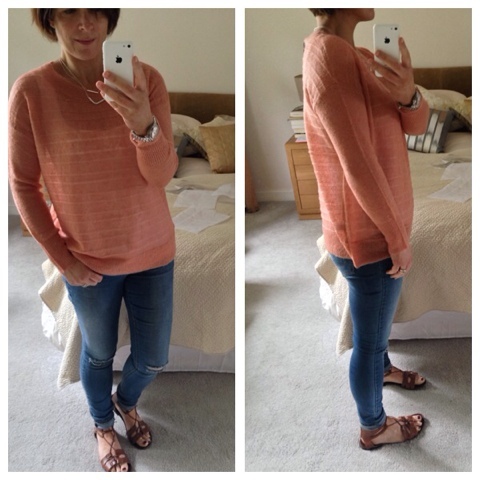 Verdict - undecided - I'm going to hold onto it for another week and see if I feel inclined to wear it. Next, these black platform sandals. I tried on one of these briefly in the shop and it seemed comfortable but I couldn't be bothered trying both on as they were tied together and it could have been disastrous given all the groceries I was holding. However, when I got them home and walked around the bedroom in them, they squeaked. I mean proper squeaking...like those annoying trainers that you used to see little toddlers wearing. It's because although they are leather lined, the straps are not leather and where they cross over at the back, they rub against each other. Such a shame as they were really comfy. 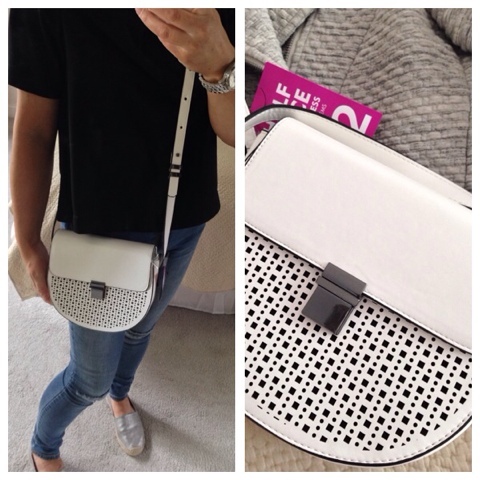 After reading about the usefulness of a white handbag over on Sue's blog, I thought I'd give this one a go. 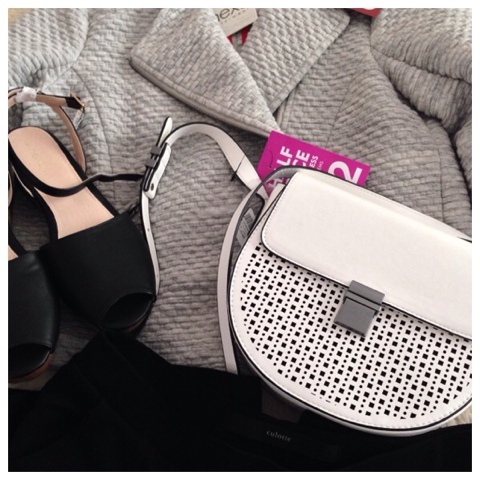 It's become the best of my sale buys in Next as I love it and have enjoyed using it every day this week. It matches everything! 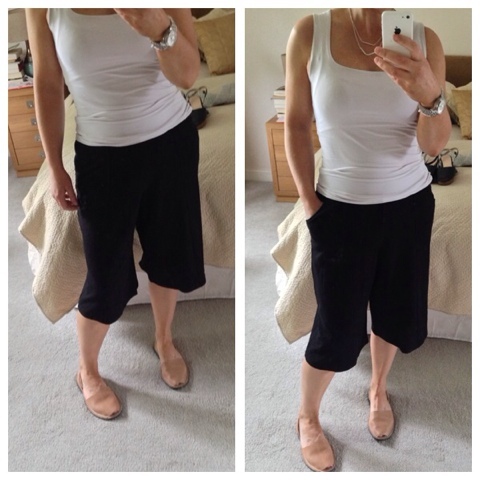 And I had to scratch the culottes itch too so I picked these slightly stretchy ones up in Next. I thought they'd be perfect but in fact, they are a funny length on me. I'd really prefer a slightly longer pair I think. starting with this jersey tube skirt which I'm thrilled with. It's got a slit up one side and is quite flattering to wear. Much cooler than a normal maxi skirt and way more flattering as it shows off the curves more. Oh and the best bit? It was £10! I'm wearing the S/M and it's about a 10-12. I also ordered the 3rd colour in the Jessica top, which I was watching for weeks to make sure it didn't go to low stock. 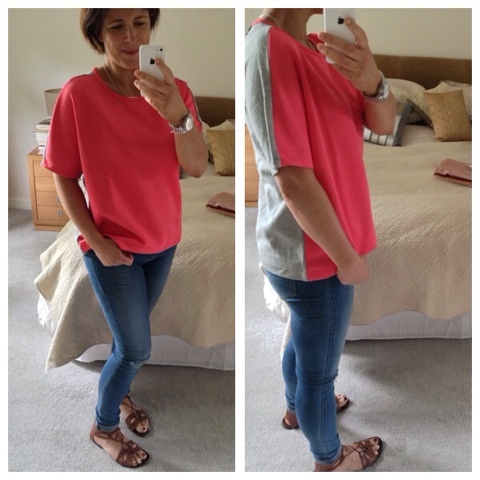 It was a deeper coral shade that I expected and too like another top I have. I did like it lots but had to be ruthless. This is the size 12. Thinking a lightweight jumper would be a useful item in the current weather, I ordered this Chain Stitch Jumper. The colour was duller than I expected though and it didn't work with my skin tone...but funnily enough, looking at these photos, I like it again...but it's too late. it's gone back. Size S/M here. 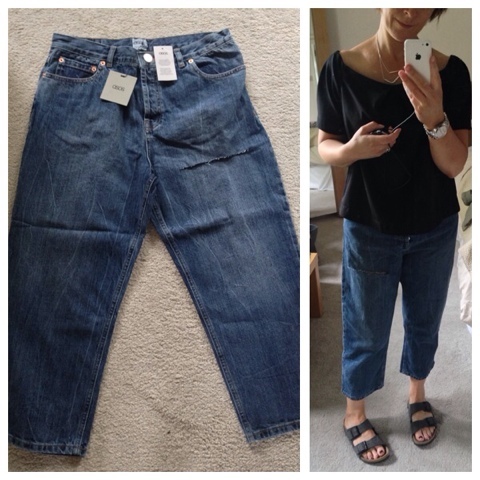 ASOS next and after seeing Michelle's post here, I ordered up the jeans she is wearing - for £10.50. But while I was at it, I saw 2 other pairs for about the same price so I thought I'd try them out given there was free delivery and free returns. 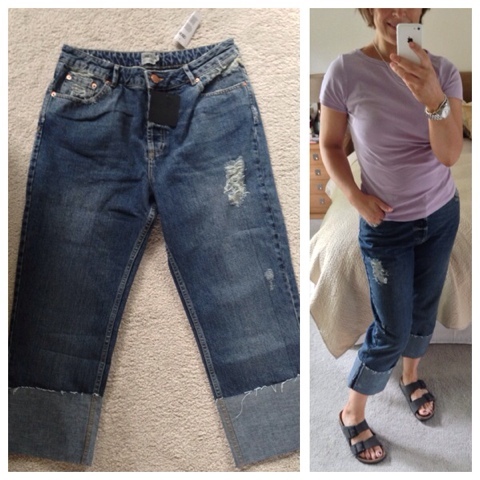 Here are the jeans Michelle bought - the Maddox Parallel Crop. The size was good (size 30) and I liked the fit...something a bit different. The buttons bothered me a bit as I struggled to open and close them. But that didn't put me off initially...the next pair I ordered did! 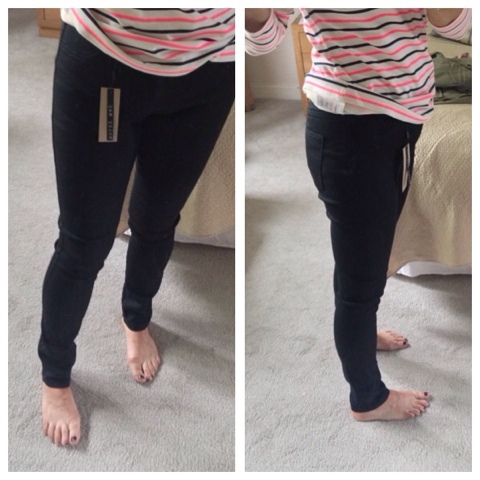 I also ordered these Noisy May black skinnies as they looked nice and tight on the model but they were too baggy around my ankles sadly and too long. These are a 12. 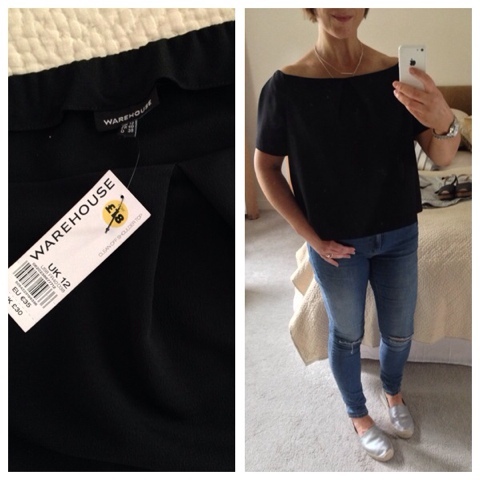 Warehouse was my next shop and once again inspired by Michelle, I bought the Clean Off The Shoulder Top here which I absolutely love..sadly no longer available online. I have concerns about how much I'll wear it but I think you can't go wrong with a plain black top and I've actually got a good set of shoulders and décolletage so I should show them off a bit more. Size 12. These mules from Warehouse were never to keep (not online) - I just liked the look of them and adding to my order meant I qualified for free delivery (and free returns). I tried them on for about 10 seconds. Couldn't walk in them. They are gorgeous though. Sorry no photos of me wearing them as I tried them on while wearing PJ's. And that's it.....for now anyway. I may take another look at the sales again when everything goes to final reductions, especially if the weather takes a turn for the better. Be assured that you will hear all about it! 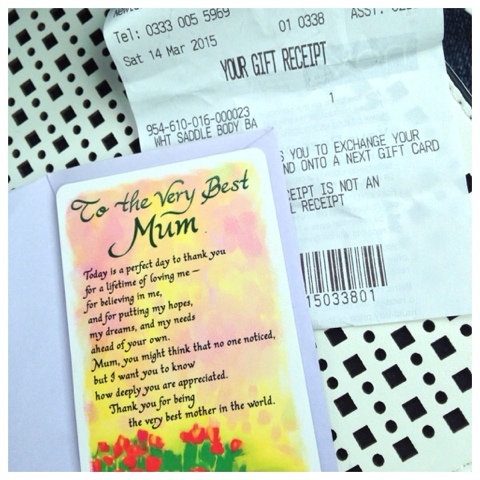 PS - funny wee story for you because inside the Next handbag was this card and a gift receipt dated March 2015. I can only guess that someone bought this for their mum and she wasn't keen so she returned it. I like to think that she didn't notice that there was this lovely card inside it....or that she was gutted that she forgot to take it out. It's also nice to think that perhaps I was meant to find it? In any case...it prompted some interesting debate amongst my Facebook friends when I shared this photo. 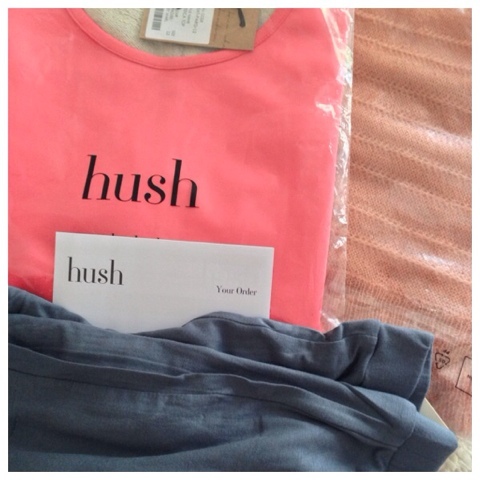 Love the Hush skirt Avril & how funny about the Mum card inside your bag, such a shame the person who it was meant for never saw the beautiful words. That Warehouse top is divine!!! Some great picks, and such a shame that the Next sandals didn't work out. Such an unusual combination of shape and heel. I think you should keep the jacket. 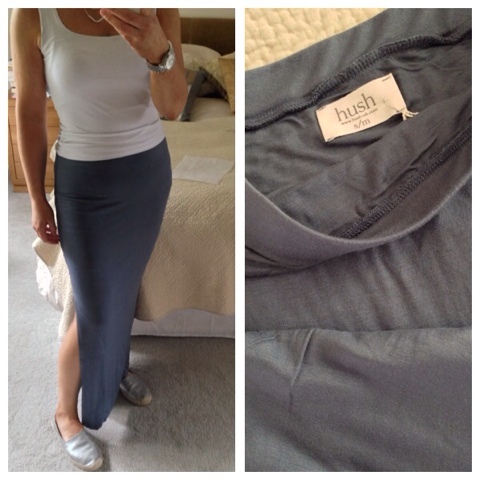 Looks really chic with the Hush skirt! What a shame about the black shoes, they looked super cute. As did the grey ones. Ability to walk is kinda important though, so I guess you made the right choice! !